For our outreach project we chose to teach our fellow friends and dormmates from Burbank house about sleep. 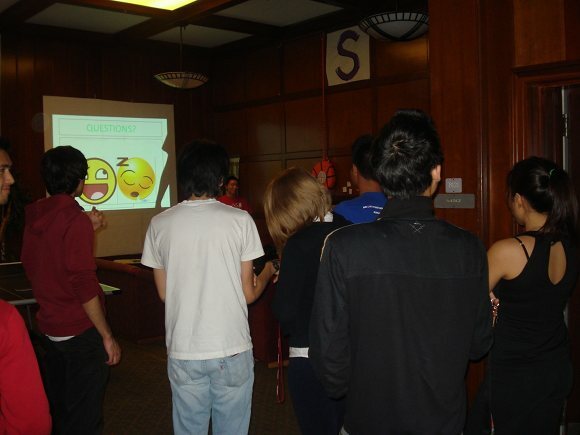 We covered topics we felt were interesting as well as important to college students such as sleep basics (i.e. sleep types, sleep cycle, sleep onset...), sleep disorders, sleep debt, drowsy driving and sleep hygiene. We feel we were very effective in delivering our message, as the students seemed engaged and interested in what we had to say. We used several videos to help explain certain topics, such as a video depicting a narcoleptic dog, which the students found surprising and entertaining. We believe these videos and our presentation helped increase the student's awareness of the importance of sleep as well as of certain sleep disorders. For example, many people seemed surprised by the notion of sleep debt, as well as by how easy it is to collect a huge debt. We explained to them that each person needs a certain amount of sleep per night, and that if they get one hour less than they needed per night for a week, they would have to sleep seven extra hours to make it up. 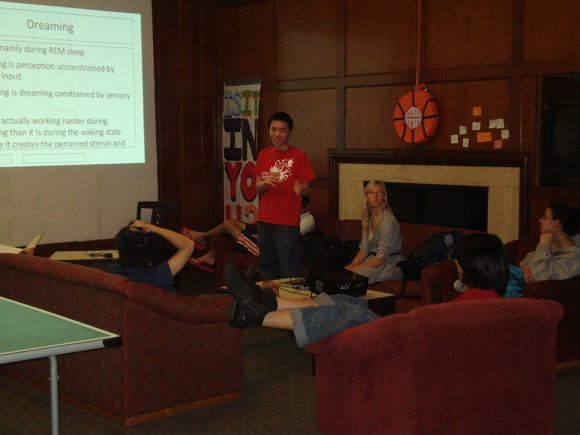 This had a big impact on the students, who, like most Stanford students, wonder why they feel tired most of the time! We also believe the students will take drowsiness more seriously in the future now that they realize it can be even more dangerous than being drunk, especially when driving! Surprisingly, the students asked questions mainly pertaining to the concept of sleep debt (surprising because it is such a simple concept!). 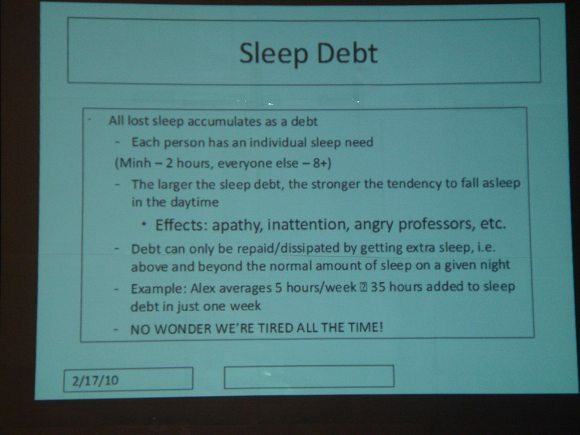 Many students had either heard myths conflicting this, or found it hard to believe that they really need to sleep extra to pay off their sleep debt, and not just get "enough" sleep the next night. Our only regret is that we didn't realize that the projector we planned to use could only connect to a PC. The two of us had Macs so we had to borrow someone else's. This person did not have Microsoft Powerpoint unfortunately, so the presentation we showed on Open Office was not as effective as it could be since it did not contain all the cool backgrounds we had planned to show. We are extremely excited we were able to send our outreach project to Kevin so certain parts of it (what you see here) could be put on this new website!